On the second day of the Gamescom convention held in Cologne, Germany, SteelSeries announced their latest gaming headset, the Siberia Elite. The original Siberia Gaming Headset was first introduced in 2004 and quickly rose to fame as one of the most comfortable and best sounding gaming headsets. Since then, SteelSeries has released many iterations of the Siberia, with the Siberia Elite being the newest member of the family. Compared to the original Siberia, the Siberia Elite’s exterior is receiving a complete overhaul. It interits the large closed-ear earpads from the original Siberia, but they are now made out of memory foam much like the ones found on the SteelSeries 7H. The wildly popular suspension headband also received a bit of padding, and SteelSeries replaced the rubber headrest cable arc with ones crafted out of sandblasted aluminum. To further enhance its flashy design, two programmable LED light rings have been added to each side of the earcup. To look even a bit cooler, the LED light rings also act as dials for intuitive volume adjustment and the pull-out microphone gets a small on/off LED indicator light as well. But wait…. there’s more! The Siberia Elite also features SteelSeries’ “next-generation” drivers for superior sound quality and comes with an integrated USB soundcard that’s capable of outputting Dolby Virtual 7.1 sound. Its cables have also been flattened similar to the cables found on the Flux in-ear headphones to prevent any chaotic tangling when they’re sitting in your bag too. Although the cable doesn’t look like it’s detachable, there’s a 3.5mm jack on the right earcup that allows for a second pair of headphones to be jacked into the Siberia Elite for simultaneous audio sharing. Finally for the Siberia Elite, SteelSeries is also launching the SteelSeries Engine 3 desktop client to give users a painless customization experience as well. The SteelSeries Siberia Elite will be available in black and white, and will be available for pre-order starting September 13th with an MSRP of $199.99. Be sure to hit the jump below for the full press release! SteelSeries, the leading global innovator of gaming peripherals, today introduced the Siberia Elite Gaming Headset. Delivering the newest generation and highest-quality SteelSeries audio drivers, the Siberia Elite headset is equipped with Dolby® technology for realistic 7.1 virtual surround sound. Siberia Elite’s amplified design includes extra-large memory foam ear cushions, SteelSeries’ signature Siberia self-adjusting suspension system connected to a sandblasted steel arc, and illumination with a choice of 16.8 million color options that radiate from each earcup. Dials on the earcups power the Siberia Elite’s audio and microphone-mute controls, while new levels of customization are supported by the newest version of peripheral configuration software, SteelSeries Engine 3. The new software will enable users to select illumination and equalizer settings, activate microphone features and more all through an intuitive and easy-to-navigate layout. Built for gaming and entertainment across multiple devices, the Siberia Elite offers limitless connectivity through its swappable cable system making it instantly compatible for PC, Mac®, tablets and phones. Available in both white and black, the Siberia Elite Headset includes memory-foam, passive-noise isolating leather ear cushions that rest comfortably around the ears. Its lightweight over-the-head suspension design also has a memory-foam padded headband with a sandblasted steel arc that automatically adjusts to fit the head. The new headset also features illuminated light rings on each earcup that can be customized and controlled to show 16.8 million brilliant colors in a variety of pulsating options. The earcups, in addition to illuminating and housing the speakers, also feature intuitive dials to quickly adjust volume and mute the microphone; furthermore, a light on the microphone provides visual indication when your mic is muted. The Sound Share port on the right earcup enables another player or viewer listen in. 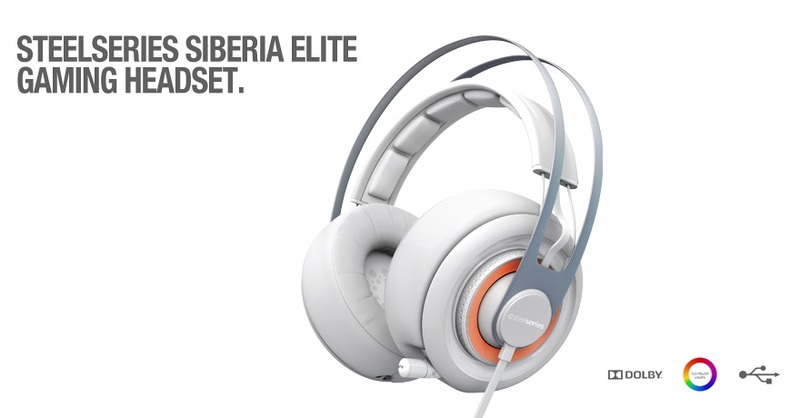 The SteelSeries Siberia Elite is $199.99 MSRP and will be available for pre-order starting in September 2013. 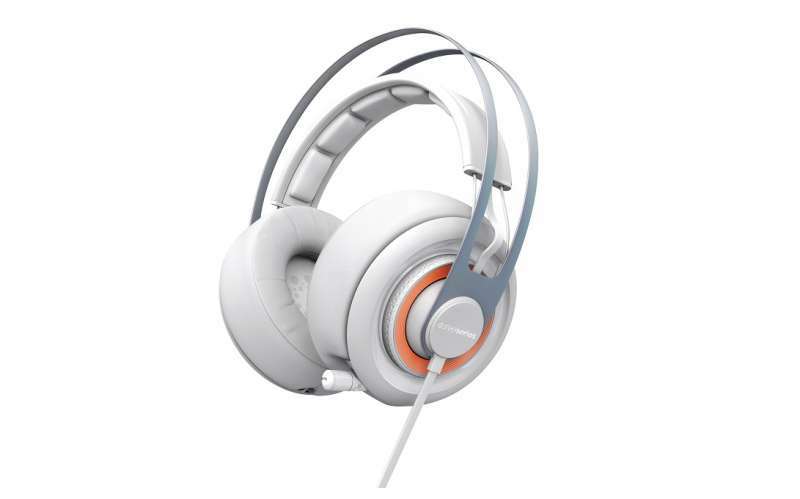 For more details about the new headset, please visit the SteelSeries website here.